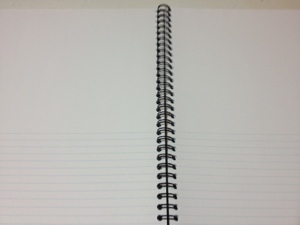 One of the worst things about different types of notebooks is that they vary in the page setup. Some have lines, some graphs, others are blank. Even the lined ones vary in the ruling between the lines. 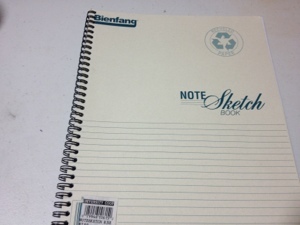 And what if you want to make a note on a sketch? Sure, you can just write it somewhere on the page, but it never really looks right, does it? Likewise with drawing on lined paper. Or what if you want to draw a diagram with a description. It will never go in any space you have left on the page, especially if it’s a long one. Well, Bienfang appears to have those people covered with the NoteSketch Book (all in different fonts so you remember it better). But we have to start with the covers first. The front cover is a nice card stock, heavy and not likely to rip out. It can take a mild beating, regular use is easily handled, but abuse isn’t. The back is cardboard and quite nice. It is light but strong, and will support drawing on ones lap or holding it in front of a subject. The paper inside is a little over half blank with the rest being roughly college ruled lines. It’s nice, but as thin as printer paper. It will only take pencil or technical pens before bleeding and wrinkling. Of course, for its intended use this is no problem. This also helps keep the book slim and it easily fits into most bags. They come in a variety of page sizes but those are all virtually identical, with the page size you like being the only deciding factor. Personally I can’t go anywhere without one of these. I don’t use them much at home, but on the road or just outside they are perfect. I don’t know about anyone else, but I only bring a pencil and a pen when I’m out, so any drawbacks from thin paper are negligible. And the ability to write notes and have space for it fits what I do. I love having a set aside space to put my thoughts or the story behind a drawing. If thats what you like to do, or you like to draft or draw diagrams that require explanation, this is the book for you. If thats not your thing, then this may just not interest you.